Dietary supplements are used by athletes at all levels of sport, reflecting the prevalence of their use in the wider society. About half of the adult US population uses some form of dietary supplements,1 and although there are regional, cultural and economic differences, a similar prevalence is likely in many other countries. Athletes describe a range of different reasons for their supplement choices,2 and products that fit the description of ‘supplement’ can target various roles within the athlete’s performance plan. These include the maintenance of good health by contributing to the required intake of specific nutrients, the management of micronutrient deficiencies, and the provision of energy and macronutrient needs that might be difficult to achieve through food intake alone. Other specific uses of supplements reported by athletes include direct performance enhancement or the indirect benefits that arise from the provision of support for hard training, the manipulation of physique, the alleviation of musculoskeletal pain, rapid recovery from injury and enhancement of mood. Some sporting bodies now support the pragmatic use of supplements that have passed a risk-versus-benefit analysis of being effective, safe and permitted for use, while also being appropriate to the athlete’s age and maturation in their sport. This review summarises the issues faced by high-performance athletes and their support team (coach, trainer, nutritionist, physician) when considering the use of supplements, with the goal of providing information to assist them to make informed decisions. A food, food component, nutrient, or non-food compound that is purposefully ingested in addition to the habitually consumed diet with the aim of achieving a specific health and/or performance benefit. multi-ingredient products containing various combinations of those products described above that target similar outcomes. is strongly influenced by perceived cultural norms (both sporting and non-sporting). because they know or believe that other athletes/competitors are using the supplement(s). Some supplements may be used for multiple functions. Zinc, for example, may be taken with the aim of promoting wound healing and tissue repair,6 or reducing the severity and duration of the symptoms of an upper respiratory tract infection.7 Carbohydrate supplements are used to enhance performance in many events via the provision of fuel substrate,8 to support the immune system9 or to improve bioavailability of other supplements, for example, creatine.10 Similarly, creatine supplementation may directly enhance performance in strength and power events, and can assist in training harder, gaining lean body mass or maintaining lean mass during periods of immobilisation after injury.11–13 Decisions on supplement use therefore need to consider both the context of use and the specific protocol employed. Supplements target a range of scenarios of use, so different approaches are needed to assess their effectiveness. Supplements aimed at correcting nutrient deficiencies need to be judged on their ability to prevent or treat suboptimal nutrient status, with the benefit accruing from the removal of the associated impairment of health, training capacity or performance. The effectiveness of sports foods might be hard to isolate when they are used within the general diet to meet everyday energy needs and nutrient targets. However, benefits may be more easily detected when they are specifically consumed before, during or after an event or training session to provide nutrients that are limiting for performance (eg, to provide fuel for the muscle or brain) or to defend homeostasis (eg, by replacing water and salt losses). Performance-enhancing supplements, which are claimed to achieve direct or indirect benefits, pose a greater challenge in terms of a sound evidence base. With only a few exceptions, there is a scarcity of research, and many of the available studies are not of sufficient quality to warrant their application to elite athletes. Substantiating the claims made about performance supplements and sports foods is difficult.14 To various audiences, ‘proof’ comes in different forms. Figure 1 provides a proposed hierarchical model of the relative strength of the evidence provided by different information sources. However, most of the information around supplement efficacy in sport comes from models with the lowest rigour: anecdotes/observations from athletes; and scientific or mechanistic hypotheses that explain how a supplement might target a critical/limiting factor in performance, but with little to no evidence. Systematic reviews and meta-analyses, which synthesise the outputs of many studies to yield a conclusive statement of efficacy in a broad sense, are at the top of the evidence hierarchy. While these summaries help to provide information about the general use of performance supplements, scientific trials that are properly controlled and well-conducted provide the basis for these reviews as well as an opportunity to address more specific questions about supplement applications. Thus, meta-analyses are a reflection only of the quality and quantity of the studies that are available for review, and may also be influenced by the inclusion and exclusion criteria applied to the available data. 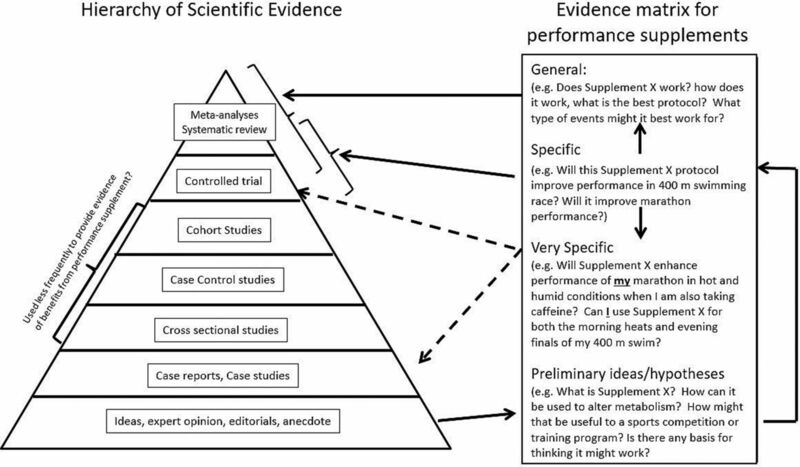 Hierarchy of evidence used to establish good practice focused on the issue of nutritional supplements. interpretation of results in light of the limitations of the study design and the change that would be meaningful to real-life sport. For the purposes of this overview, we rely primarily on studies of healthy adults that are relevant to athletes. We recognise that data from studies of elite athletes are almost entirely absent. We also recognise that mechanistic studies on animal and cell culture models are useful in identifying mechanisms, but a mechanism is not necessary to demonstrate an effect that may be meaningful to an athlete: what we think today to be the mechanism by which enhancement of performance or health occurs might be proved wrong by later studies. It must also be recognised that an individual’s habitual diet can affect gene expression and their microbiota, and these in turn can affect response to supplementation. While the variation in the genome between individuals is less than 0.01%, the variation in microbiota is significant (80%–90%), and emerging data suggest that both these factors could affect athletic performance.16 17 The following sections present an overview of the use of supplements to address different roles in sports nutrition, first by identifying the principles of use and then by examining some of the specific products that have a good or emerging evidence base to support this situation-specific use by athletes. Many micronutrients play an important role in the regulation of processes that underpin sports performance, ranging from energy production to the manufacture of new cells and proteins. A frank deficiency of one or more of these nutrients may lead to a measurable impairment of sports performance—either directly or by reducing the athlete’s ability to train effectively (eg, iron deficiency anaemia) or to stay free from illness or injury (eg, impact of vitamin D deficiency on bone health). Athletes are not immune to the inadequate eating practices or the increased nutrient loss/requirements found in some members of the general population and may even be at greater risk of deficiencies because of increased nutrient turnover or increased losses. A further challenge is the occurrence of subclinical deficiencies that may be both hard to assess (ie, they lack a clear metric or universal threshold of what is ‘adequate’) as well as being subject to debate about whether there is an ‘optimal’ level for performance that differs from the usual classification systems of nutrient status (deficiency/subclinical deficiency/normal). When suboptimal nutritional status is diagnosed, the use of a nutrient supplement to reverse or prevent further deficiencies can contribute to the overall treatment plan. has a baseline assessment against which future measures to assess progress can be compared. Nutrients that often need to be supplemented under these circumstances include iron, calcium and vitamin D (table 1). Iodine (for those living in areas with low levels of iodine in foods or not using iodised salt), folate (for women who might become pregnant) and vitamin B12 (for those following a vegan or near-vegan diet) supplementation may be warranted in these population groups, but these considerations do not apply specifically to athletes. Sports nutrition guidelines provide clear recommendations for targeted intake of energy and nutrients in a variety of contexts. In some situations, it is impractical for an athlete to consume ‘everyday’ or normal foods to meet their nutrition goals due to issues around preparation or storage, ease of consuming the foods due to training schedules, gut comfort, or the challenge of meeting nutrient targets within the available energy budget. In these cases, sports foods can provide a convenient, although usually more expensive, alternative option for meeting these nutrient goals. Table 2 provides an overview of products that fit this description and their more common evidence-based uses. Summary of common sports foods and functional foods used by athletes. A few performance-enhancing supplements might, at the present time, be considered to have an adequate level of support to suggest that marginal performance gains may be possible. These supplements include caffeine, creatine (in the form of creatine monohydrate), nitrate, sodium bicarbonate and possibly also Beta-alanine. The mechanisms of action, typical dose, potential performance benefits and known side effects of each of these supplements are summarised in table 3. Performance-enhancing supplements should be considered only where a strong evidence base supports their use as safe, legal and effective, and ideally after adequacy of sports nutrition dietary practices is ensured. Whenever possible, supplements should be trialled thoroughly by the athlete in training that mimics the competition milieu as closely as possible before committing to use in a competition setting. Athletes should do a careful risk analysis to see if the marginal gains would outweigh the risk of inadvertent doping due to contamination. Many dietary supplements claim to enhance performance indirectly—by supporting the athlete’s health, body composition, and their ability to train hard, recovery quickly, adapt optimally, avoid or recover from injury, and tolerate pain or soreness. Illness is a major problem for athletes if it interrupts training or occurs at a critical time, such as during a selection event or a major competition. Susceptibility to illness is increased in situations where athletes are involved in a high volume of training or competition, and either intentionally or unintentionally experience deficits in energy intake (eg, weight loss diets), macronutrient intake (eg, train-low or sleep-low-carbohydrate) and micronutrient status (eg, vitamin D insufficiency in the winter).19 Athletes might benefit from nutritional supplements to support immunity in these scenarios and at other times when they are either susceptible to infection (eg, during the common cold season and after long-haul travel) or suffering from an infection. Table 4 summarises evidence for some of the commonly promoted ‘immune supportive’ supplements, noting that the most promising candidates to assist in the prevention or treatment of upper respiratory symptoms are vitamin D and probiotics. Vitamin C during periods of heavy exertion and zinc lozenges at the onset of symptoms may be useful, but high doses of single antioxidants, particularly vitamins C and E, may blunt exercise-induced training adaptations.20–22 Probiotic supplementation may reduce the incidence of travellers’ diarrhoea and gastrointestinal infection. Cochrane reviews have noted the low quality of many studies on nutritional supplements that are claimed to support immunity; specifically, small samples, poor controls and unclear procedures for randomisation and blinding were commonplace.23 24 Clearly, there is a pressing need for randomised controlled trials in high-level athletes with sufficient participant numbers, rigorous controls and procedures, appropriate supplementation regimens, and clinically meaningful measures of immunity. Adverse effects from the use of supplements may arise from a number of factors, including the safety and composition of the product per se and inappropriate patterns of use by athletes. Poor practices by athletes include the indiscriminate mixing and matching of many products without regard to total doses of some ingredients or problematic interactions between ingredients. Even commonly used products may have negative side effects, especially when used outside the optimal protocol. For example, iron supplementation in those with already adequate iron stores can result in symptoms that may begin with vomiting, diarrhoea and abdominal pain, and develop to haemochromatosis and liver failure.26 Bicarbonate may cause gastrointestinal distress when ingested in amounts sufficient to enhance performance; this can impair rather than improve performance and may counteract the benefits of other supplements taken at the same time.27 The ‘more is better’ philosophy, when applied to caffeine, may result in side effects, including nausea, anxiety, accelerated heart rate and insomnia, that outweigh the performance benefits.28 Unwanted outcomes become more common with caffeine doses ≥9 mg/kg body mass, but maximal benefits are usually achieved with intakes of 3–6 mg/kg.29 The possibility of more serious outcomes is illustrated by adverse, and potentially fatal, responses in two separate incidents in which very large doses (up to 30 g) of caffeine were administered to healthy volunteers participating in laboratory studies (http://www.telegraph.co.uk/news/2017/01/25/university-fined-400k-students-taking-part-caffeine-experiment/). These incidents were due to errors in the dose calculation: if this can happen in a university research environment with supposed oversight by experienced staff, the potential clearly exists for similar errors by athletes and coaches. Athletes and members of their support team should be aware of the regulations that govern the manufacture and marketing of supplements. According to the 1994 DSHEA (https://ods.od.nih.gov/About/DSHEA_Wording.aspx) passed by US Congress, nutritional supplements sold in the USA that do not claim to diagnose, prevent or cure disease are not subject to regulation by the Food and Drugs Administration (FDA). Similar regulations apply in most other countries, where supplements are regulated in the same way as food ingredients and are therefore not subject to the stringent regulations that are applied to the pharmaceutical industry. This means that there is no requirement to prove claimed benefits, no requirement to show safety with acute or chronic administration, no quality assurance of content, and liberal labelling requirements. It is well-recognised that there are problems with some of the dietary supplements on sale, but the options open to those responsible for food safety are limited by the legislation that applies. The FDA regularly uses its powers to recall products in breach of the regulations, although they fully admit that their resources are insufficient for comprehensive monitoring, and recalls generally occur only after many people are harmed (https://www.fda.gov/food/recallsoutbreaksemergencies/recalls/default.htm): they have recently recalled supplement products containing excessive doses of vitamins A, D, B6 and selenium because of potentially toxic levels of these components. Examples of product complaints have included the presence of impurities, including lead, broken glass and metal fragments, because of the failure of the producers to observe good manufacturing practice. The risk of gastrointestinal upset because of poor hygiene during the production and storage of products is also of concern. Although this may seem a minor inconvenience, and of similarity to food safety issues, the coincidence of problems around a crucial training period or competitive event may significantly interfere with the athlete’s performance goals. It should be noted, though, that all of these problems are also regularly reported in normal foods. Some supplements may actually cause harm to health, but these can be difficult to identify, and products are usually withdrawn only after a significant number of adverse events have occurred. For example, a range of products containing hydroxycitric acid were withdrawn from sale, but only after they were linked with the death of one consumer and with a substantial number of other cases of liver toxicity, cardiovascular problems and seizures (https://www.fda.gov/downloads/safety/recalls/enforcementreports/ucm169089.pdf). The extent of the problem is illustrated by the fact that, in the USA in 2015, approximately 23 000 emergency department visits annually are reported to be associated with dietary supplement use.30 This figure can be viewed as substantial, or it can be seen as small compared with the total number of adverse responses associated with the use of medications.15 However, minor problems that do not require acute medical aid may still be sufficient to interrupt training or prevent participation, so this statistic probably underestimates the risk for athletes. The biggest concern for athletes who compete under an antidoping code (usually the World Anti-Doping Code, as published by WADA) is that supplements can contain prohibited substances that result in an antidoping rule violation (ADRV). Athletes—and their support teams—may be at risk for an ADRV if there is evidence that they have used or attempted to use products containing ingredients on the Prohibited List (www.wada.ama.org). A common problem is the recording of an adverse analytical finding (AAF) of a prohibited substance in a urine sample (‘positive drug test’) as a result of supplement use.31 Millions of athletes may be subject to antidoping testing, although these are mostly professional-level, national-level or international-level athletes. For these athletes in particular, even if the ingestion of the prohibited substance was unintentional, the rules of strict liability within the World Anti-Doping Code mean that an AAF will be recorded, and may mean the loss of medals won or records set, and financial sanctions as well as temporary or permanent suspension from competition. It also damages the athlete’s reputation and may lead to loss of employment and income through failed sponsorship opportunities. Where there has been deliberate cheating or benefit accrued from the use of a prohibited substance, these penalties seem entirely appropriate, but it is undoubtedly true that some ADRVs can be attributed to the innocent ingestion of prohibited substances in dietary supplements, with catastrophic results for the athlete. In some cases, the amount of the prohibited substance in a supplement may be high, even higher than the normal therapeutic dose. For example, Geyer et al 35 reported the analysis of metandienone (commonly known as methandrostenolone or Dianabol) in high amounts in a ‘body building’ supplement from England. The recommended amount of the supplement would have supplied a dose of 10–43 mg; in comparison, the typical therapeutic dose of this drug was 2.5–5 mg/day,36 although its medical use has been discontinued in most countries for many years. This amount would certainly have a potent anabolic effect, but would likely produce serious side effects, including psychiatric and behavioural effects, and significant damage to a range of body systems including the liver.37 Unlike many of the earlier cases involving steroids related to nandrolone and testosterone, this is not a trivial level of contamination and raises the possibility of deliberate adulteration of the product with the intention of producing a measurable effect on muscle strength and muscle mass. Most reports of adverse health outcomes resulting from supplement use have focused on liver problems of varying degrees of severity, but other organs are also affected. One epidemiological case–control study38 examined the association between use of muscle-building supplements and testicular germ cell cancer (TGCC) risk, with 356 TGCC cases and 513 controls from eastern USA. The OR for the use of muscle-building supplements in relation to risk of TGCC was elevated (OR=1.65, 95% CI 1.11 to 2.46), with significantly stronger associations for early users and longer periods of use. Ironically, supplements that are contaminated with extremely small amounts of prohibited substances—too low to have any physiological effect—may still cause a positive doping outcome. For instance, ingestion of 19-norandrostenedione, a precursor of nandrolone, will result in the appearance in the urine of 19-norandrosterone, the diagnostic metabolite for nandrolone. If the urinary concentration of 19-norandrosterone exceeds 2 ng/mL, an AAF is recorded.39 The addition of as little as 2.5 µg of 19-norandrostenedione to a supplement can result in a urinary concentration of 19-norandrosterone that exceeds this threshold.40 These amounts are close to the limits of detection of the analytical methods currently applied to the analysis of dietary supplements, and are far below the levels of contamination deemed acceptable from a health and safety perspective. Various efforts are being made to address the problems, including the use of third-party auditing activities to identify products that athletes may consider to be at ‘low risk’ of containing prohibited substances. There can be no absolute guarantee that any product is entirely safe, but these schemes do help the athlete to manage the risk. Athletes contemplating the use of dietary supplements should consider very carefully whether the possible benefits outweigh the risks of a doping offence that might end their career. Dietary supplements are an established part of the landscape of modern sport and are likely to remain so. Athletes who take supplements often have no clear understanding of the potential effects of supplements they are using, but supplements should be used only after a careful cost-benefit analysis has been conducted. On one side of the decision tree are the rewards, the most obvious of which are correction of nutrient deficiencies, achievement of nutritional goals, or enhancement of one or another physiological/biochemical function to directly or indirectly improve performance. On the other side lie the costs, the possibility of using an ineffective supplement, the possible risks to health and the potential for an ADRV. A flow of questions that could be posed in reaching an informed decision is shown in figures 2 and 3. 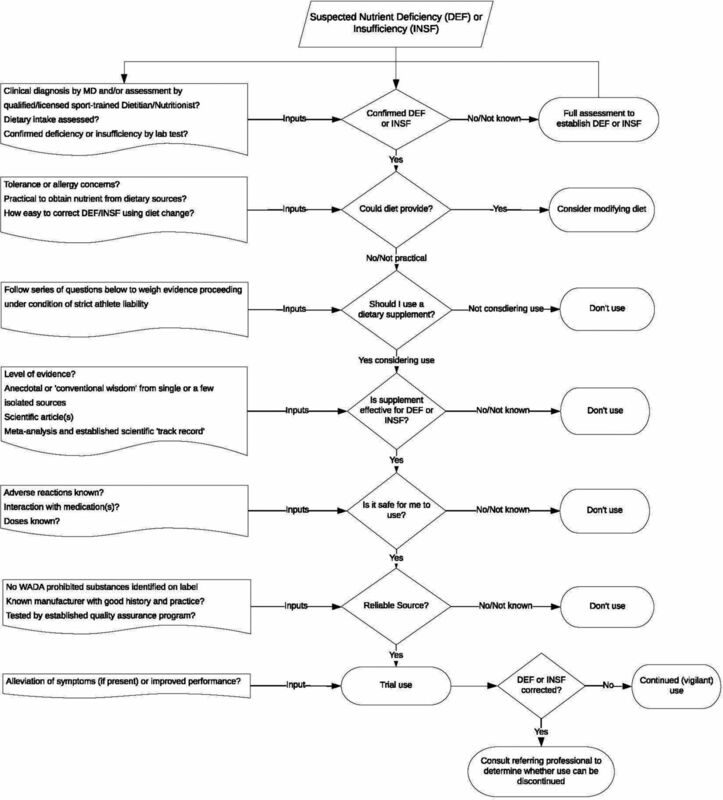 Flow chart to guide informed decision making and reducing risk of antidoping rule violation during nutritional supplement use. MD, medical doctors. 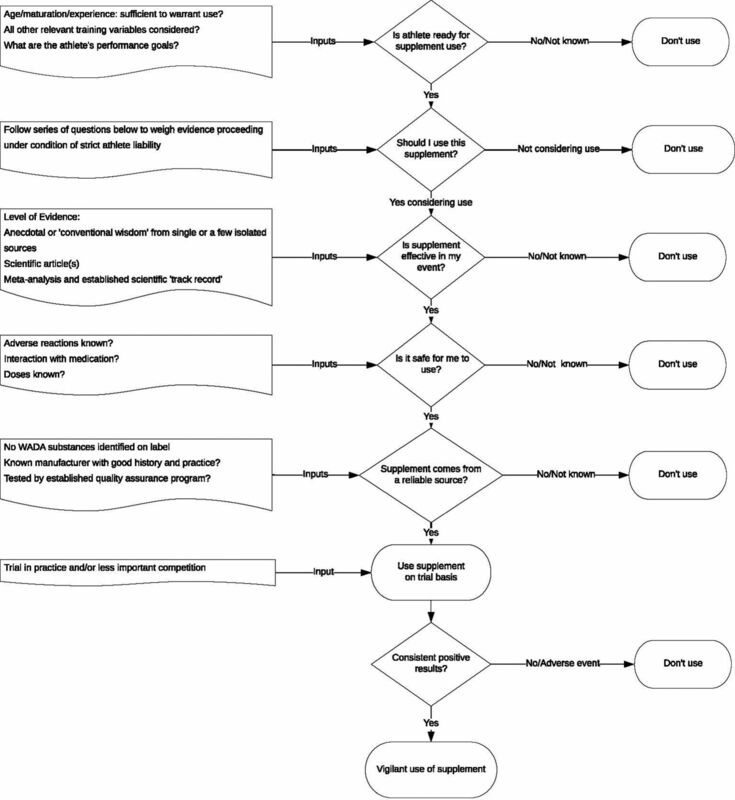 Flow chart to guide informed decision making and reducing risk of antidoping rule violation during ergogenic supplement use. In deciding whether to use a supplement, athletes should consider all aspects of their maturation in, and preparation for, their event to ensure that the supplement under consideration provides an advantage that no other strategy can address. Whether the supplement is practical to use should also be assessed: is the product available, affordable, tolerated and compatible with the athlete’s other goals? The input of the athlete’s coaching team and medical/science support network is important. Athletes who do not have regular access to such a network should consider decisions around supplement use as an important reason to consult an independent sports nutrition expert as well as a physician. Analysis of the evidence around the effectiveness of supplements and their safety is often difficult. A complete nutritional assessment may provide an appropriate justification for the specific use of nutritional supplements and sports foods. For a small number of sports supplements, there is good evidence of a performance effect or indirect benefit for some athletes in some specific situations with little or no risk of adverse outcomes.28 41 Professional advice is often important in ensuring that the athlete is sufficiently knowledgeable about the appropriate protocol for use of these supplements, but individual athletes may respond very differently to a given supplement, with some exhibiting a markedly beneficial effect while others experiencing no benefit or even a negative effect on performance. Furthermore, the situation in which the athlete wishes to use the supplement may differ in important ways from its substantiated use. Repeated trials may be necessary to establish whether a true effect, rather than just random variation, is seen in response to use of any novel intervention. Some trial and error may also be involved in fine-tuning the supplement protocol to suit the needs of the specific situation of use or the individual athlete. Evidence to support the effectiveness and safety of many of the supplements targeted at athletes, however, is largely absent. There seems to be little incentive for those selling supplements to invest the substantial sums needed to undertake detailed scientific evaluation of their products. Even where some evidence does exist, it may not be relevant to the high-performance athlete because of limitations in the study design (such as the specificity of the exercise tests), the study population or the context of use. Failure to verify the composition of the supplements used may also give misleading results. It seems sensible to exercise caution when using supplements, as any compound that has the potential to enhance health or exercise performance by altering physiological function must also have the potential for adverse effects in some individuals. Athletes should see good evidence of a performance or other benefit, and should be confident that it will not be harmful to health, before accepting the financial cost and the health or performance risks associated with any supplement. Finally, the athlete should be sure, if supplements or sports foods are to be used, that they have undertaken due diligence to source products that are at low risk of containing prohibited substances. Dietary supplements can play a small role in an athlete’s sports nutrition plan, with products that include essential micronutrients, sports foods, performance supplements and health supplements all potentially providing benefits. Some supplements, when used appropriately, may help athletes to meet sports nutrition goals, train hard, and stay healthy and injury-free. A few supplements can directly enhance competition performance. However, it takes considerable effort and expert knowledge to identify which products are appropriate, how to integrate them into the athlete’s sports nutrition plan, and how to ensure that any benefits outweigh the possible negative side effects, including the potential for an ADRV. A strict risk-benefit analysis involving a decision tree approach to the effectiveness, safety and risks should identify the small number of products that may benefit the athlete. Such an analysis requires the input of a well-informed sports nutrition professional. Supplements UNood. Dietary supplement health and education act of 1994. 1994. https://ods.od.nih.gov/About/DSHEA_Wording.aspx#sec31994 (accessed 22 Nov 2017).
. Athletes and Supplements - prevalance and perspectives. Int J Sport Nutr Exerc Metab. In Press. 2018.
. Making decisions about supplement use. Int J Sport Nutr Exerc Metab. In Press. 2018.
. Consensus Statement Immunonutrition and Exercise. Exerc Immunol Rev 2017;23:8–50.
. Zinc for the common cold. Cochrane Database Syst Rev 2013;6:CD001364.
. Hohe Dosen des Anabolikums Metandienon in Nahrungserganzungsmitteln. Deutsche Apotheke Zeit 2002;142:29.
. Pharmacological basis of therapeutics. 5th edn: Macmillan Publishing Co, 1975:1462.
. Hepatotoxicity associated with illicit use of anabolic androgenic steroids in doping. Eur Rev Med Pharmacol Sci 2017;21:7–16.
. Principles of nutritional assessment. Second Edn. New York, NY: Oxford University Press, 2005.
. Caffeine ingestion during exercise to exhaustion in elite distance runners. Revision. J Sports Med Phys Fitness 1991;31:425–32.
. Mechanisms of muscular adaptations to creatine supplementation: review article. Int SportMed J 2007;8:43–53.
. Creatine Supplementation Increases Total Body Water Without Altering Fluid Distribution. J Athl Train 2003;38:44–50.
. Acute versus chronic sodium bicarbonate ingestion and anaerobic work and power output. J Sports Med Phys Fitness 2001;41:456–62.
. Is there an optimal vitamin D status for immunity in athletes and military personnel? Exerc Immunol Rev 2016;22:42–64.
. Position statement. part one: immune function and exercise. Exerc Immunol Rev 2011;17:6–63.
. Glutamine, exercise and immune function. Links and possible mechanisms. Sports Med 1998;26:177–91.
. Effects of creatine supplementation and resistance training on muscle strength and weightlifting performance. J Strength Cond Res 2003;17:822–31.
. Nutrition and traumatic brain injury: improving acute and subacute health coutcomes in military personnel. Washington, DC: National Academies Press, 2011.
. The effect of Omega-3 fatty acid supplementation on the inflammatory response to eccentric strength exercise. J Sports Sci Med 2011;10:432–8.
. Effects of variation in protein and carbohydrate intake on body mass and composition during energy restriction: a meta-regression 1. Am J Clin Nutr 2006;83:260–74.
. Chromium picolinate supplementation for overweight or obese adults. Cochrane Database Syst Rev 2013;11:Cd010063.
. Chitosan for overweight or obesity. Cochrane Database Syst Rev 2008;3:Cd003892.